Pakistan Telecommunication Authority (PTA) in an announcement revealed that from 1st of August 2014, no SIM can be sold or activated without biometric verification of the customer. This is applicable throughout Pakistan and as per this new policy, before the SIM could be activated or purchased; the customer has to verify their identity via thumb impression. This is to confirm that the CNIC customer is using for activation of SIM is original and legitimate or not. As per procedure, after presenting the original identity card to the sales representative, a customer has to verify via thumb impression recording that the CNIC belongs to him/her. CNIC number and thumb impression recording will be matched in real time with the database of NADRA. After the procedure is successfully completed, only then the customer will be provided with the newly activated SIM. Old method of SIM activation via 789 is discontinued and new biometric verification system is now in place. Biometric verification system helps to make sure that CNIC belongs to the holder. At the time of getting NADRA CNIC, the thumb impression is recorded and it is used during this process. 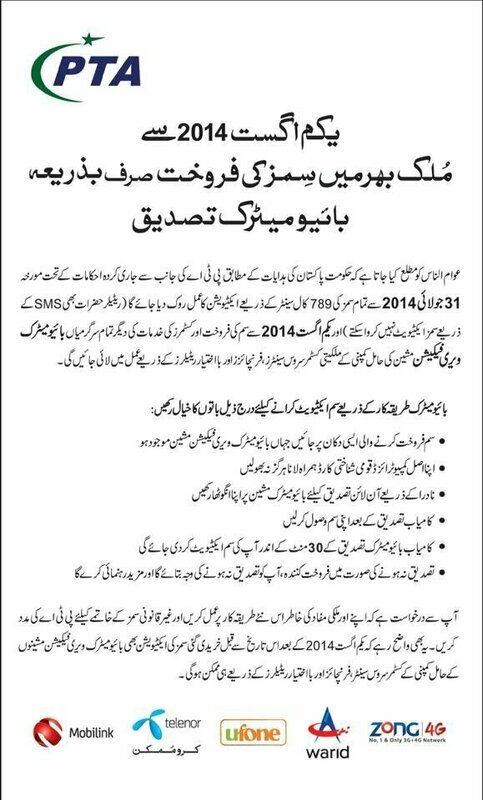 Now no one will be able to use fake CNIC or CNIC of other people in order to purchase new SIM. The question of prime importance still remains unanswered by PTA as they did not disclose anything about verifying or re-verifying already activated SIMs. There are 139 million cellular connections active in Pakistan and a very high number of these SIMs is unregistered or registered with fake CNICs. New biometric policy is very good.today is 5 august 2014 but all mobile companies are sold their sims through 789(old process).why these companies are not act on these PTA Policies?